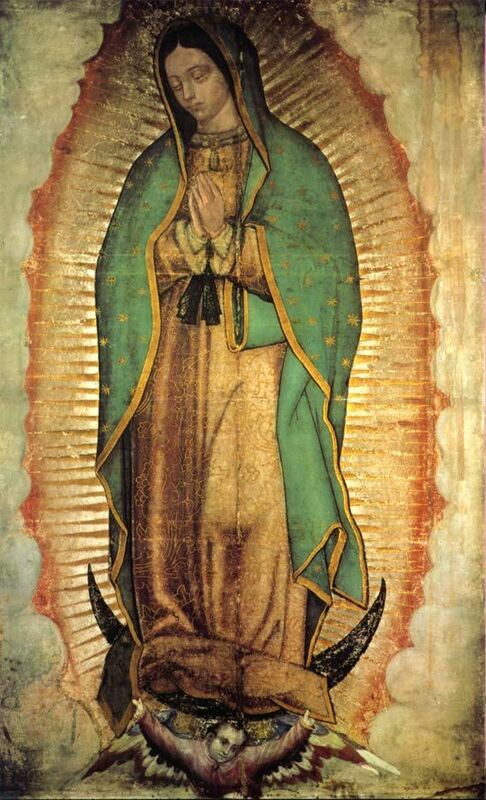 Today we celebrate Our Lady of Guadalupe, the Patroness of Mexico and Latin America. Official Catholic accounts state that on the morning of December 9, 1531, Juan Diego saw an apparition of a maiden at the Hill of Tepeyac, in what would become the town of Villa de Guadalupe in the suburbs of Mexico City. Speaking to him in the native Nahuatl language, the maiden asked that a church be built at that site in her honor; from her words, Juan Diego recognized the maiden as the Virgin Mary. Diego recounted the events to the Archbishop of Mexico City, Fray Juan de Zumárraga, who instructed him to return to Tepeyac Hill, and ask the “lady” for a miraculous sign to prove her identity. The first sign was the Virgin healing Juan’s uncle. The Virgin told Juan Diego to gather flowers from the top of Tepeyac Hill, where he found Castilian roses, not native to Mexico, blooming in December on the normally barren hilltop. The Virgin arranged the flowers in his tilma or cloak, and when Juan Diego opened his cloak before Bishop Zumárraga on December 12, the flowers fell to the floor, and on the fabric was the image of the Virgin of Guadalupe (Our Lady of Guadalupe, Wikipedia). But when the fullness of the time came, God sent forth His Son, born of a woman, born under the Law… (Galatians 4:4, NASV). Tell me, you who want to be under law, do you not listen to the law? For it is written that Abraham had two sons, one by the bondwoman and one by the free woman. But the son by the bondwoman was born according to the flesh, and the son by the free woman through the promise. This is allegorically speaking, for these women are two covenants: one proceeding from Mount Sinai bearing children who are to be slaves; she is Hagar. Now this Hagar is Mount Sinai in Arabia and corresponds to the present Jerusalem, for she is in slavery with her children. But the Jerusalem above is free; she is our mother (Galatians 4:21-26). Carrier argues that the woman in Galatians 4:4 should be taken allegorically because the women in Galatians 4:24 (Hagar and Sarah) are taken allegorically to represent two covenants. Rather, I think that St. Paul is drawing out an allegory from the literal and historical human birth of Christ to the Blessed Virgin. Sarah is a typological pre-figuring of Mary. Sarah’s miraculous conception and birth is the first fruits of God’s covenant with Abraham, a covenant that through the offspring of Isaac, all nations will be blessed (Genesis 22:15-18). This covenant culminates in a second, greater, miraculous conception, which is the fulfillment of God’s covenant with Abraham to bless all nations of people. However, if Christ is not truly an offspring of the line of Abraham, Isaac, and Jacob, St. Paul would not think that this covenant was truly fulfilled. Thus, the woman in Galatians 4:4 should be understood to be a real flesh and blood mother, if Christ is to be the fulfillment of God’s promise to Abraham. So, St.Paul takes a literal event, Christ’s birth to a woman, and ties it to Genesis 17, where he promises that Sarah will give birth to a child. The beauty of the Catholic understanding of scripture is often “both…and” rather than “either…or”. Carrier wants the woman in Galatians 4:4 to be allegorical rather than literal. The Catholic response is not to say that she is literal rather than allegorical, but that she is both a literal mother and an allegorical mother. Mary is, allegorically, the Mother of the New Covenant. We see, particularly in the Gospel of Luke, to how Mary is likened to the Ark of the Covenant. She is the Ark of the New Covenant. So then, brethren, we are not children of a bondwoman, but of the free woman (Galatians 4:31, NASV). …“Behold, your mother!” (John 19:27). Christ adopts St. John the Evangelist as His brother in the last moments before His death. And John took Mary into his household as his mother from that moment. So we too should take Mary into our household as our mother. Today, we honor Mary the Mother of God, as it is through her offspring that all nations, including the nations indigenous to the Americas, were, and are, blessed. The Covenant to God extends out from the tribes of Israel to all tribes and nations of the Earth. And so she appeared to her children in Mexico in 1531. When they saw her, they knew she was their mother. Nuestra Señora de Guadalupe, ruega por nosotros.